False Solomon's Seal, (Smilacina racemosa), is something I had read about when living in Kansas but just this last summer actually located in the wild here in Quebec. A beautifully, fascinating woodland plant I have been digging up bits and pieces of information on the web and through books and have False Solomon's Seal ear-marked for experimentation in the kitchen this season. You can learn along with me as I explore this plant and learn more about it and how to use it. Last fall I collected seeds from several plants and I plan to try my hand at introducing it to my wild shade garden this year. I wish now I had taken the time to plant some seeds last fall but kept what I collected inside...so they set in the fridge in moist sand in hopes that will stratify them well enough before I plant them in the spring. (Always something new to learn!) Best as I can gather they need to stratify for at least 3 months before planting and are hardy in zones 3-7. The growth rate is moderate at best and the first year you should not expect plants as the seeds will be establishing roots. The foliage should follow the second year but germination can take up to two years. Division of rhizomes seems to be the best way to go if you are wanting plants established rather quickly. 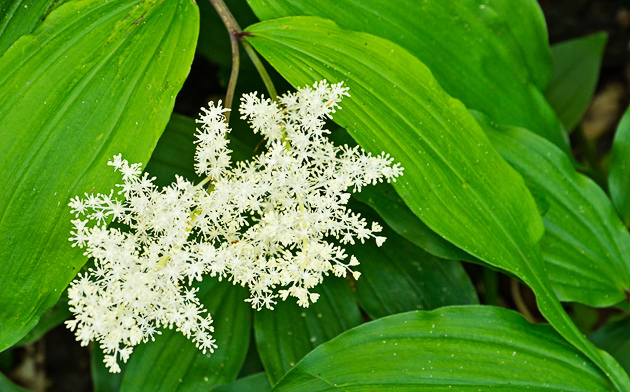 False Solomon's Seal prefers rich woods, thickets, and moist clearings and can be found from Canada south to Missouri and the mountains of North Carolina. A tall herbaceous perennial growing from thick, whitish, branching rhizomes, False Solomon's Seal is often found growing in dense groupings. The leafy, arching stems grow to about 3' tall and the leaves are smooth-edged, broad and elliptical, and are borne alternately along the stem in two rows. The leaves are distinctly parallel-veined (monocot) and often clasping. The flowers bloom in April-July and are small, white, strongly perfumed and form a dense, terminal cluster. 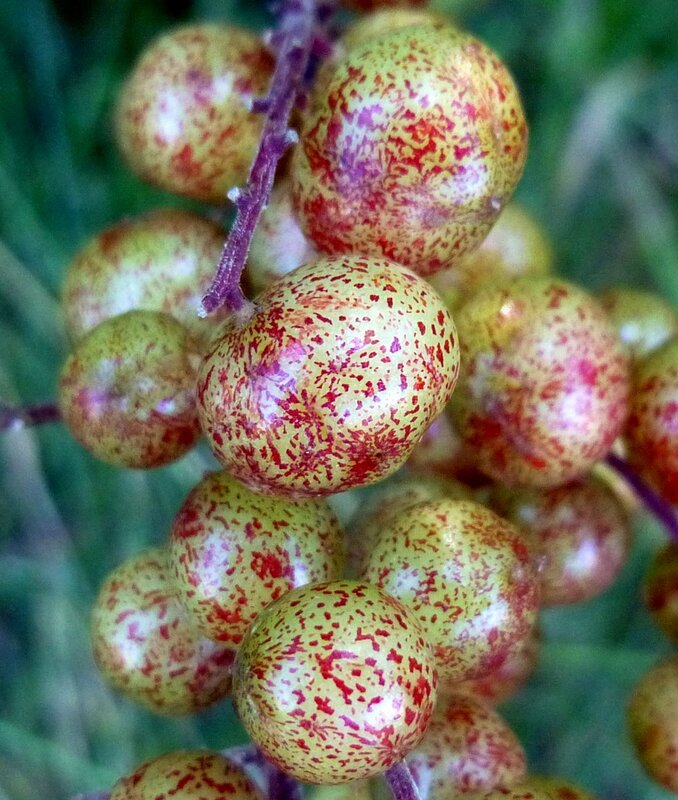 The berries are small (5-7 mm diameter) and densely clustered too, at first being green or brown and mottled or striped, ripening to bright red. The young greens and shoots of False Solomon's Seal resemble true Solomon's Seal (Polygonatum canaliculatum) and grows in the same areas. Both are interchangeable and can be used as an asparagus substitute by cooking for 5 minutes in boiling water and served with butter or a cheese sauce. The fleshy rhizomes where soaked in a lye bath over night and boiled until tender by Native Indians of North America and the ripe berries can be eaten raw alone or mixed with other fruit or honey to act as a purgative if you are constipated or to help prevent scurvy. The flavor of the berries is noted as being rather bitter/sweet resembling molasses but we will taste test them later this year for an up-to-the-minute account on their flavor. Plants for a Future says that a jelly can be made from the berries and that cooking will reduce the laxative effect of the berries. Also note when you go to their site that they make reference to the fact you must consume a large quantity of the berries to cause the purgative effect...sounds like grounds for major experimentation next fall since the berries are easy to collect as they grow in terminal clusters.